This page contains a downloadable version of the "NT-Enabled," or last, version of InfoCentral 7, macros, utilities, and tips for InfoCentral 7, and the example IBases which shipped with InfoCentral 7. The iBases (and, of course, the macros and utilities) were not included with the downloadable version. They are very useful for learning, and for basing your own IBases on. For questions, please check the InfoCentral FAQ. Oh yes, and if you want the InfoCentral manual, I converted it from Envoy format to PDF, and that is available as well. Downloading it shouldn't take more than a few moments on a decent broadband connection, and should provide you with all the information you will need. InfoCentral 7.0.2 (the "NT-Enabled," final version). Or just the files, zipped. Version 1.2. FINALLY, updated Area Code and State databases for InfoCentral. Version 1.2 adds a honking lot of codes for the Netherlands and the U.K., plus some minor U.S. updates. Download the NewData.zip file from link at left. Unzip it, and follow the instructions in ReadMe.txt. PLEASE SEND ME CHANGES AND CORRECTIONS if you find any errors! These could not have been done without Glenn Delahoy's nifty MoveData utility, for which I am eternally grateful. His work is worth appreciating, and I encourage all to go to Glenn's Software and show it. Version 2.3: 3/27/06. 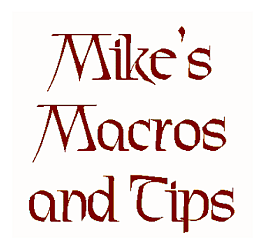 Version 2.3 of Mike's Modular Macros for InfoCentral. This needs its own page to describe. 1/03/01. Contains an "Add Internet Location" macro for InfoCentral, which restores the "Add Internet Location" functionality. Unfortunately, does not work on NT systems. 1/4/07. Contains an "Address Book" macro for WordPerfect and InfoCentral, updated to version 1.07, which allows you to access InfoCentral as you would the Address Book. Not as new as the stuff in Modular Macros. 7/12/00. The InfoCentral Application Programming Interface files, from the Office 7 Pro Library disk. If you want to get down and dirty with the programming, this is what you need. 7/27/99. Includes my replacement macro for InfoCentral's CallerID function, which will actually announce calls on your computer. 1/16/10. An archive explaining (in README.WPD) how to create related files with newer versions of WordPerfect, with examples. Includes an updated WPICRUN.INI file to replace the old one. 1/14/00. Contains EXPOLIST.MXE, a macro to export a list into ASCII comma-delimited format. Works with the WordPerfect macro"EXPOLIST.WCM" (available in the ENVELOP8.ZIP or ENVELOP9.ZIP archive, depending on your WordPerfect version) to create a merge data file automatically. 12/20/03. Two macros (one for WordPerfect, one for InfoCentral) that work together and allow you to access your InfoCentral data from within WordPerfect! Select a category or tab, select from the list of the objects in that category or on that tab, and you can create a WordPerfect Merge Data file automatically, Insert or Delete the selected data, access FastFind, or use E-mail or the Web. Third version release. This is pretty darned cool. Makes the "ExpoList" macro unnecessary. Click here for a more detailed description and to see what it looks like. 01/21/04. I converted the InfoCentral manual, originally in Envoy format, to Adobe Acrobat format, and you can download that from this link. InfoCentral for Linux 05/18/08. Although InfoCentral will not function on Windows Vista or 7 (unless run in a Windows 98 or XP virtual machine), one resourceful gentleman has managed to get it to work on Linux, using WINE. Hilary Wright's instructions and files to get InfoCentral working on Linux may be downloaded from the link at left. 1/22/04. The InfoCentral macros manuals in WordPerfect document format. I have made a number of corrections and additions. 04/10/03. Contains MAKMENU.MNW, a replacement menu for InfoCentral, including macro functions. Included with the Envelope utilities as well. Added: a brief description on how to customize InfoCentral. 1/03/02. Contains PALMEXPOLIST.MXE, a macro to export a list of Persons and Organizations into ASCII comma-delimited format, combining the information and putting it in perfect order for importing to Palm Desktop 4. Allows you to enter your information into InfoCentral, then export easily to your Palm. 10/20/00. A discussion of InfoCentral versus CorelCENTRAL; its strengths and weaknesses, and what could be done to improve it. AUTO.ZIB For keeping track of auto maintenance and mileage. CD.ZIB For keeping track of a CD collection. CONTACT.ZIB A basic IBase for contact tracking. HINTS.ZIB Hints for using InfoCentral. HOME.ZIB IBase for keeping track of your household furnishings and information. PARTY.ZIB IBase for party planning. REAL_EST.ZIB Real Estate information tracker. STAMP.ZIB To keep track of your stamp collection. Easily modifiable for coins or other collections. TRAVEL.ZIB Includes information about travel destinations and planning. VIDEO.ZIB For keeping track of your video collection. WINES.ZIB Information about wines, and tracking a wine collection.